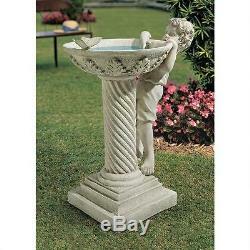 Young Lad Splashing Little Boy Child Garden Statue Pedestal Butterfly Birdbath. We've never seen a boy who could pass a puddle by! Our young lad climbs barefoot to peek over the wide rim of our pedestal birdbath and mischievously splash a graceful butterfly in this perfect sculptural celebration of childhood summers. Cast in quality designer resin and hand-finished to replicate fine stonework, our artistically rendered exclusive is a true heirloom investment. Butterfly is a separate piece; please locate butterfly before discarding packaging. Please visit our store for more great products! Feel free to ask any questions. Looking for more unique gift ideas? Celtic, Gothic, Greek, Roman, Art Deco, & More! The item "Young Lad Splashing Little Boy Child Garden Statue Pedestal Butterfly Birdbath" is in sale since Friday, August 18, 2017. This item is in the category "Collectibles\Decorative Collectibles\Figurines\People". The seller is "stephaney74" and is located in Palm Coast, Florida. This item can be shipped to United States, Canada, United Kingdom, Denmark, Romania, Slovakia, Bulgaria, Czech republic, Finland, Hungary, Latvia, Lithuania, Malta, Estonia, Australia, Greece, Portugal, Cyprus, Slovenia, Japan, China, Sweden, South Korea, Indonesia, Taiwan, South africa, Thailand, Belgium, France, Hong Kong, Ireland, Netherlands, Poland, Spain, Italy, Germany, Austria, Israel, Mexico, New Zealand, Philippines, Singapore, Switzerland, Norway, Saudi arabia, Ukraine, United arab emirates, Qatar, Kuwait, Bahrain, Croatia, Malaysia, Brazil, Chile, Colombia, Costa rica, Panama, Trinidad and tobago, Guatemala, Honduras, Jamaica.